Details of the NROL-38 spacecraft and its mission are classified, however much can be inferred from what is known about the launch, and previous missions. The use of an Atlas V 401 means that the payload has relatively low mass, whilst NOTAMS issued for the launch show that the Atlas will fly due East from Cape Canaveral, indicating a low-inclination orbit. The payload is therefore likely to be a Satellite Data System (SDS) communications satellite, destined for geostationary orbit. Previous Atlas launches of geostationary SDS satellites have used the less-powerful Atlas IIAS rocket to place the spacecraft into geosynchronous transfer orbits with comparatively low perigees, whereas the last launch, which used a Delta IV, placed its payload into a much higher transfer orbit. The Atlas V’s Centaur upper stage has been painted white, improving its ability to reflect heat on missions which require the Centaur to enter an extended coast phase. It is not clear whether an extended coast is required to deploy NROL-38; the Centaur was originally slated to be used in the launch of a GPS satellite which would have required a longer coast, and the Centaur may have to make a long coast between spacecraft separation and a disposal burn which will deorbit it into the Pacific Ocean. If a similar flight profile to the earlier Atlas missions is used, then spacecraft separation will occur around half an hour after launch into an orbit approximately 275 by 37,500 kilometres (170 by 23,300 statute miles, 150 by 20,250 nautical miles) in altitude with 26.5 degrees of inclination. With an extended coast phase like the Delta IV launch, spacecraft separation will come much later in the flight; probably around two hours after liftoff, into an orbit closer to 6,600 by 35,000 kilometres (4,101 x 21,750 statute miles, 3,600 x 19,000 nautical miles) inclined at 17.5 degrees. The Satellite Data System is a series of spacecraft used by the NRO to relay secure communications to and from reconnaissance assets, including other satellites. SDS uses satellites in both geostationary orbit, and in highly elliptical Molniya orbits. NROL-38 is believed to be the eighteenth SDS satellite, and is probably a third-generation spacecraft. The third-generation satellites, also known as Quasar, have been in operation since 1998 or 2000, with NROL-38 being the seventh or eighth spacecraft to launch. Seven first-generation SDS satellites were launched into Molniya orbits between June 1976 and February 1987. These spacecraft were constructed by Hughes, based around the HS-312 bus, and provided twelve UHF channels for communications. Launches took place from Space Launch Complex 4W at Vandenberg, using Titan III(34)B carrier rockets. The original constellation consisted of three satellites; OPS 7837, 7940 and 7310. Four further satellites, OPS 5805, USA-4, USA-9 and USA-21, were subsequently launched as replacements, and to augment the system. Second generation satellites were also built by Hughes, using either the HS-381 or 389 bus, and carried more transponders than their predecessors, including a K-band downlink. The first was USA-40; launched in August 1989 aboard the Space Shuttle Columbia during STS-28, it was placed into a Molniya orbit using an Orbus-21S perigee motor and onboard propulsion. The next satellite, USA-67, was the first SDS to be placed into geosynchronous orbit. Its November 1990 launch aboard the Space Shuttle Atlantis during STS-38 was used to cover the deployment of the Prowler satellite, whose existence is still not acknowledged by the US government. As a result of this deception, USA-67 was for a long time misidentified as a Magnum signals intelligence satellite; Magnum satellites used a two-stage Inertial Upper Stage to reach geosynchronous orbit, whilst USA-67 was taken part-way to a geosynchronous transfer orbit by a single Orbus-21S before raising its orbit using onboard propulsion. The Orbus-21S was incorrectly identified as being the first stage of the IUS, with Prowler’s upper stage being identified as its second stage. It was only after Prowler was exposed that USA-67 was correctly identified as being an SDS satellite. The third second-generation spacecraft, and the last to be deployed by Space Shuttle, was launched in December 1992 aboard Discovery, during STS-53. 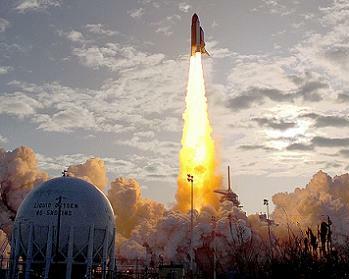 The last was launched in July 1996 atop a Titan IV(405)A from Cape Canaveral. Designated USA-87 and USA-125 respectively, both spacecraft operated in Molniya orbits. There is some uncertainty over whether the next satellite, USA-137 or NROL-5, was a fifth second-generation satellite, or the first third-generation satellite. It was launched to a Molniya orbit in January 1998, and was the only SDS satellite to use an Atlas IIA carrier rocket. While the subsequent change to the more powerful Atlas IIAS has been identified by some as the transition between second and third generation satellites, the use of a Titan IV to launch USA-125 despite the availability of both the Atlas IIA and IIAS suggests that the Atlas could not be used to launch that spacecraft, and hence USA-137 would be the first third-generation spacecraft. The next spacecraft, USA-155 or NROL-10, was launched in December 2000 and placed into a geostationary orbit. It was followed by another geostationary satellite, USA-162 or NROL-12 in October 2001. USA-155 operated at a longitude of 10 degrees west until it was replaced last year, whilst USA-162 is still in operation at 144 degrees west. The next two launches placed satellites into Molniya orbits; USA-179 or NROL-1 was launched in August 2004 by the last Atlas IIAS, with USA-198 or NROL-24 being the payload of a December 2007 Atlas V 401 launch. The most recent launch occurred in March 2011, with a Delta IV-M+(4,2) carrying USA-227 or NROL-27 towards a geostationary orbit. USA-227 replaced USA-155 at 10 degrees west. Given its timing relative to the launch of USA-227, compared to the timing of the launches of USA-155 and USA-162, NROL-38 looks likely to be a replacement for USA-162, confirming that third-generation SDS satellites have a lifespan of around 10-12 years. Assuming it does replace USA-162, NROL-38 will operate at a longitude of 144 degrees west over the Pacific. 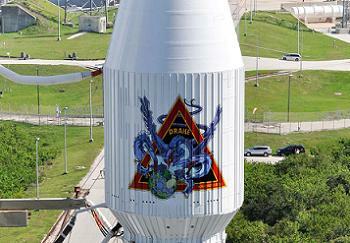 NROL-38 will be launched by Atlas V AV-023. Flying in the Atlas V 401 configuration, AV-023 consists of a Common Core Booster (CCB) first stage, with a single-engined Centaur (SEC) upper stage, no solid rocket motors, and a four-metre (13.1 foot) diameter payload fairing. The Large Payload Fairing (LPF), which despite its name is the smallest of the three four-metre fairings used on the Atlas V, is being flown on this launch. Originally developed for the Atlas I, the LPF is 12.2 metres (40 feet) long, and is so named because at the time of its introduction it was the largest Atlas fairing available. The other two fairings, the Extended Payload Fairing (EPF) and Extra-Extended Payload Fairing (XEPF), were introduced in the late 1990s and 2005 respectively. The EPF is 90 centimetres (3 ft) longer than the LPF, with the XEPF being 90 centimetres longer than the EPF. Three five metre (16.4 foot) fairings are also available. The Common Core Booster is powered by a Russian-built RD-180 engine. It burns RP-1 propellant, oxidised by liquid oxygen. The Centaur upper stage is powered by an RL10-A-4 engine, fuelled by liquid hydrogen with liquid oxygen again being used as an oxidiser. No details of AV-023’s flight profile have been published, however its flight plan can be inferred from previous missions. At T-2.7 seconds, the RD-180 engine will ignite, achieving full thrust at around T-0. Liftoff will occur at T+1.1 seconds, with the rocket rolling to the correct azimuth to take it east-south-east of Cape Canaveral, out over the Atlantic Ocean. The vehicle’s velocity will exceed Mach 1, the speed of sound, around 81 seconds after launch, passing through the area of maximum dynamic pressure, max-Q. Around four minutes after launch, the engine will be throttled back to reduce acceleration towards the end of the first stage burn. Booster Engine Cutoff, the end of the RD-180’s burn, will occur around four minutes and three seconds after liftoff, with stage separation coming six seconds later. The Centaur’s RL10 engine will ignite ten seconds after staging. Fairing separation will occur early in the Centaur’s first burn, probably around four and a half minutes after liftoff. Following the separation of the payload fairing, the NRO usually stop releasing information about the status of the mission. If the target orbit is a low-perigee transfer orbit, the Centaur will probably burn for around eleven minutes. This burn will be followed by a coast phase lasting around ten minutes, before a four minute burn to inject the spacecraft into geosynchronous orbit. Alternatively, if it is following a mission profile with an extended coast phase, the Centaur will make a longer first burn, around 13 minutes in duration, after which it will coast for 90-100 minutes, followed by an 80-second final burn. Following the second Centaur burn, the spacecraft will separate from the upper stage. After spacecraft separation, the Centaur will be deorbited into the Pacific Ocean. Airspace has been reserved southwest of Hawaii, with entry expected between 21:16 and 22:21 UTC. The satellite will use its onboard propulsion systems to raise itself into geosynchronous orbit. AV-023 launched from Space Launch Complex 41 at the Cape Canaveral Air Force Station. Built in the 1960s as a Titan III launch complex, LC-41 as it was then named supported its first launch in December 1965, when it was used by a Titan IIIC carrying the LES-3 and 4, Oscar 4 and OV2-3 spacecraft. In total, ten Titan IIICs, seven Titan IIIEs, and ten Titan IVs launched from SLC-41, carrying an array of spacecraft including the Viking missions to Mars and the Voyager missions to the outer planets. The final Titan launch from SLC-41 occurred in April 1999, when a Titan IV(402)B failed to place a Defense Support Program satellite into geosynchronous orbit. Six months after the failed DSP launch, the fixed and mobile service towers at the complex were demolished, and work began to construct the current Atlas V complex. Wednesday’s launch marks the twenty-seventh Atlas launch from the pad, equalling the number of Titan launches from the complex, and bringing the total number of launches from SLC-41 up to fifty four. The Atlas V is, along with the Delta IV, one of two Evolved Expendable Launch Vehicles (EELVs) developed under a US Air Force programme to standardise the rockets being used to launch US Government spacecraft. Wednesday’s launch marks the 50th flight of an EELV. The EELV programme began in 1994 when the US Air Force began initial studies of a rocket to replace the Delta II, Atlas I and II, and Titan IV. Four companies bid for the contract; Boeing proposed a rocket derived from a proposal for the cancelled National Launch System contract, Alliant Techsystems proposed a rocket derived from the Titan IVB’s SRMU boosters, with an RL10-powered upper stage, and McDonnell Douglas and Lockheed Martin put forward proposals which eventually became the Delta IV and Atlas V.
The EELV programme originally called for rockets which could be flown in medium and heavy configurations; for some systems a light configuration was also proposed, however these were not developed. The Boeing proposal would have been powered by a first stage engine derived from the RS-25. The heavy configuration would have added two Titan IV SRMU boosters. The ATK medium proposal called for an SRMU first stage with a Centaur-derived upper stage, possibly with an additional solid-fuelled second stage between them. For the heavy configuration three additional SRMUs would have been clustered around the medium core vehicle, with the core SRMU being air-lit. 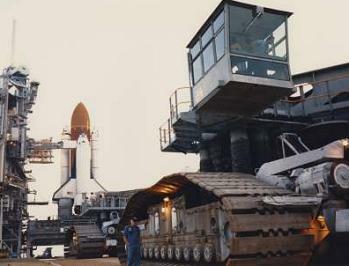 The ATK proposal was rejected, whilst the Boeing proposal was withdrawn following Boeing’s merger with McDonnell Douglas. 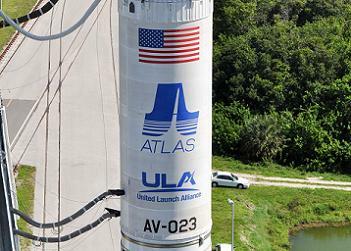 The Atlas V was developed from the Atlas II, with the interim Atlas III serving as a stepping-stone in development. It consists of a Common Core Booster first stage powered by a Russian-built RD-180 engine, derived from the RD-170 developed for the Zenit and Energia rockets. The second stage, a Centaur, is available in single or dual-engine configurations, however to date all launches have used single-engine Centaurs. Two diameters of payload fairing are available; either four or five metres. Between zero and five solid rocket motors can be added to the first stage to augment its thrust at liftoff, forming a series of “intermediate” configurations which were not part of the original proposal. As originally proposed, the Atlas V included light and heavy configurations. The Atlas V Light was intended to use a modernised version of the Agena upper stage, named Agena 2000. The Atlas V Heavy would have used two additional Common Core Boosters burning in parallel with the first stage, combined with a stretched five metre fairing. These configurations have been cancelled, however United Launch Alliance has stated that it would develop the Heavy configuration should it become necessary. The Delta IV is, except for solid rocket motors, and all-cryogenic vehicle, fuelled by liquid hydrogen and liquid oxygen. Its medium configuration consists of an RS-68-powered Common Booster Core first stage, with a four metre RL10-powered Delta Cryogenic Second Stage. Like the Atlas V, a series of intermediate configurations were introduced, the Delta IV Medium+. These add two or four GEM-60 solid rocket motors, with a five-metre upper stage being used on some configurations. Unlike the Atlas V, the Delta IV Heavy was developed. It consists of a the same basic vehicle as the medium, but with a five-metre upper stage, and two additional Common Booster Cores burning at liftoff. The Delta IV Small was not developed, however it would have consisted of a Common Booster Core with a Delta-K second stage, and an optional solid-fuelled third stage. It would have served as a direct replacement for the Delta II following the abandonment of the Delta III programme after three consecutive launch failures. 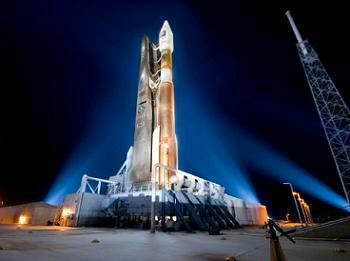 The Atlas V was the first EELV to fly, making its maiden flight in August 2002 with Eutelsat’s Hot Bird 6 spacecraft. Three months later, the Delta IV made its maiden flight, also carrying a Eutelsat spacecraft; Eutelsat W5. The Delta IV has been used primarily for military launches; Eutelsat W5 is the only commercial satellite it has launched, and aside from three NOAA GOES weather satellites launched under commercial contracts, and one demonstration flight, all of its missions have orbited military spacecraft. By contrast, about half of the Atlas V’s launches have carried military payloads, the other half carrying commercial communications satellites, and scientific and planetary missions for NASA. Wednesday’s launch was the thirty-first flight of the Atlas V, and the sixth to carry an NRO payload. The Atlas V has also launched eight commercial communications satellites, six military communications satellites, two flights of the X-37B spaceplane, a Space Test Program technology demonstration mission, a military weather satellite, a missile detection satellite, and six NASA missions; the Solar Dynamics Observatory to study the Sun, the Mars Reconnaissance Orbiter and Mars Science Laboratory to study Mars, the LRO and LCROSS missions, launched on a single rocket, to study the moon, the New Horizons mission to Pluto, and the Juno mission to Jupiter. In its nineteen flights, the Delta IV has performed one launch of a commercial comsat, four launches with military communications spacecraft, one demonstration launch with a dummy payload and two nanosatellites, six launches for the National Reconnaissance Office, as well as having launched three government weather satellites under commercial contracts as part of the NOAA’s Geosynchronous Operational Environmental Satellite (GOES) programme, one military weather satellite, one missile detection satellite, and two navigation spacecraft. Both EELVs have experienced one failure. 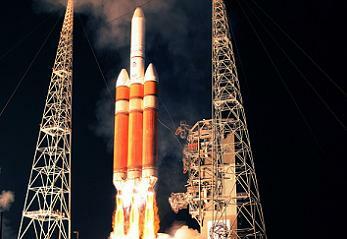 The Delta IV’s came on its fourth launch, and the maiden flight of the Heavy configuration, in December 2004. Carrying a demonstration payload, the rocket reached a significantly lower than planned orbit after a problem with fuel cavitation caused all three Common Booster Cores to cut off prematurely. The perigee of its final orbit was around 20,000 kilometres (12,500 statute miles, 11,000 nautical miles) lower than expected, and two nanosatellites being carried as secondary payloads were placed into such a low orbit that they decayed before radio contact could be established with them. 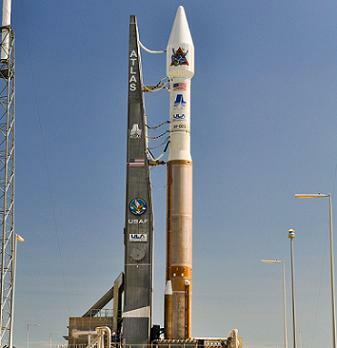 The Atlas V’s failure occurred in June 2007, on its tenth launch. Flying in the 401 configuration, with a white Centaur for a mission with an extended coast phase, the rocket was carrying the NROL-30 payload, a pair of Naval Ocean Surveillance System (NOSS) satellites. A faulty valve led to the liquid hydrogen leaking out of the upper stage during the coast phase, and as a result the stage shut down slightly early during its second and final burn. The spacecraft were able to correct their own orbits, and are now believed to be operational, however the manoeuvre may have resulted in a reduction of their operational lifespan. Prior to 2006, the Delta IV was built and operated by Boeing, with the Atlas V built by Lockheed Martin, and operated by International Launch Services on their behalf. In December 2006, manufacturing and operation of both rockets, along with Boeing’s Delta II, was merged into a single company, United Launch Alliance (ULA). 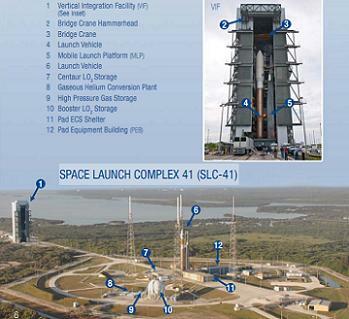 Wednesday’s launch is the sixty-first for ULA. The next EELV launch is currently scheduled for next Thursday, when a Delta IV Heavy will launch from Cape Canaveral with another NRO payload, NROL-15. This launch will be the first flight of the Delta IV with RS-68A first stage engines replacing the RS-68s used on previous flights. The next Atlas V launch is scheduled for early August, when an Atlas V 401 will launch from Vandenberg with NROL-36 and several CubeSats. This will be followed by another 401 from Cape Canaveral at the end of August, carrying NASA’s Radiation Belt Storm Probes. Two further Atlas launches are expected by the end of the year; in October an Atlas V 501 is scheduled to launch the third X-37B mission, and in December an Atlas V 401 is expected to launch a Tracking and Data Relay Satellite, TDRS-K, for NASA. 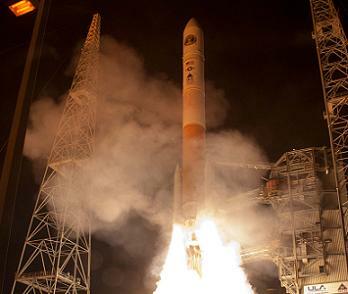 Another Delta IV launch, with a GPS satellite, is scheduled for October.